Hair Club Charlotte is located in a one story all brick building with white trim. All buildings in the business park area look the same. The building is located in the South Point Business Park (behind the Japan 49 Restaurant) across the street from the Shell gas station. The park's mailboxes are to the right of the building. IMPORTANT NOTE: Enter in Suite 100 "Private Consultations". I have been a long time client and have been pleased with my service in Charlotte. The manager and stylist always take great care of me. When ever I need anything they are quick to help. I have been a client for 15 years and pleased with my service. Thank you Shelley, Lori and staff. A little over a month ago, I was asked to participate as a HC client to model for extensions’ training being provided by visiting stylists. I agreed. The HC extensions were a perfect match in hair color and a very nice quality of hair. I thought the extensions were fun, since I have very thin hair, and cannot grow it long. However, they did not exactly suit me. They were heavy and I felt my thin hair on top was not blending well. A month later my regular stylist, Tawanna, who gives me XTrands hair replacement service, took out the original extensions so they could be cleaned and she replaced them with a second set of identical extensions. She placed and cut them, still leaving them long as the previous extensions, but wow, what a difference a talented, personal stylist makes ???? !! The extensions look so natural, and blend in beautifully with my natural hair. You would never know it is not my own hair. I don’t have to worry about the tabs showing at all. I don’t know what she did differently, but it was superior to the training. Tawanna is also my XTrands stylist. I like when she gives me a few highlights for variation. For the first time in many decades I am enjoying my hair. Thank you HC for Tawanna. If Tawana is not the best person in the Charlotte location, she is definitely in the top 10%! When she replaced my hair, it was just about perfect, the more I examined the hair the more pleased/impressed I was with what she had done! The new piece was about as perfect as it could get! Tawana does a great job for me during every visit I have with her and I appreciate her and the great products the Hair Club does for us. Hair club has been a wonderful experience. It is quite expensive, but, My hair is much healthier now. If yor hair is thinning, don't wait to long before coming for treatments. I find the whole facility to be awesome. Great environment, nice facility and the employees/stylists are the bomb. Let's face the facts- there's nothing great about losing your hair. It's a dramatic experience. I fought with joining HCM and hesitantly took the leap. More than 10 years later the few people I've told are genuinely shocked- they couldn't tell. I also look forward to my visits. The staff is professional and friendly. My stylist Sarah is one in a million. She can interpret what I want and provide a style that gives me confidence in the workplace. Her sense of humor makes the time fly during every visit. Scheduling is top notch and the facility has a nice vibe. So as you contemplate your next step with hair loss I would encourage you to do yourself a favor and at least schedule an appointment to learn more. If your experience is anything like mine at the Charlotte location you will be glad you did it. Excellent professional service. Highly recommend this location. Just beginning my procedure, sorry I cannot leave a rating at this time but will return in the future and complete what I feel is the correct star rating. As a professional hairstylist for 33 years and a professional entertainer I never dreamed I would end up going to Hair Club for Men. This is definitely something new for me and something that I am trying to get adjusted to. After several appointments HC has put their heart into trying to help me be satisfied with the procedure that I chose. Thank you, Sarah for all your hard work! Sabrina, when I left Saturday I felt like you had put your heart and soul into trying to make me feel the best a man could feel about himself! Christy, you made me a believer that you would stand behind your company and its product! I have been a member for almost 2years and I have seen several stylists in my short time and all are great but I have two stylists that are the best that's Jaleesa and Sabrina. When I met them it was like meeting an old friend from the past they made me feel like family and I appreciate that. If you are ever in the Charlotte area stop in and see for yourself. I've been a member for many years and continue to be impressed by the professionalism and courtesy of the staff in Charlotte. Christy has put together a great overall winning team and she is to be commended along with the many outstanding stylists Tawana, Chastity, Lori, Tammy. Would highly recommend the center and will continue to use their services. I have been a member for over ten years and it has been a great experience. The staff is always very friendly and my stylist (Sarah M.) ROCKS! I have been a client in Charlotte for 25 years and never experienced doubt with my decision to join HC. The Charlotte facility &amp; staff is the best. My most recent visit was special since I had a new stylist. Cindy was great! Took the time to give me a great great cut and was very professional. Great customer service, always prompt on appointments, Hair looks good! the staff at the charlotte location are very good. they always call to remind you of you apt or if you have to reschedule they work with to get you in asap! cant say enough about them! I have been a client for 20 years at the Charlotte NC office and I have the highest regard for all the great folks at Hair Club of Charlotte. The staff is always great to work with and my hair always looks fantastic. If you are considering Hair Club, then I highly recommend partnering with these folks. Tim C. Columbia SC. EVERYONE THERE ARE SO HELPFUL. RANDY IS ALWAYS HELPFUL SCHEDULING APPOINTMENTS TO FIT MY SCHEDULE. IF ANY PROBLEMS ARISE MINDY SLOVES THEM QUICKLY AND EFFECTIVEIY!!!!!! LORI MY STYLIST. CANT SAY ENOUGHT ABOUT HER. SHE IS VERY GOOD AT WHAT SHE DOES,IS CARING AND PAYS ATTENTION TO THE SMALLEST DETAILS!!!!! SHE HAS BEEN MY STYLIST FOR YEARS AND I WOULD NOT USE ANYONE ELSE!!!!! I CANT COUNT HIGH BUT I CAN ALWAYS COUNT ON LORI!!!!!! The staff are friendly and wonderful. Jamie and Mindy are awesome!!! I would recommend HCM to friend and family. I have recommend . I have been a member since the early 90's. Excellent service. Stylists always are courteous and helpful. Thank you Joey and Tammy,you are the best. I joined HC 7 years ago. It has had a positive impact my appearance, I look younger and has helped professional as well as socially. I see the cost as an investment. So far the ROI is great. The staff at the Charlotte location is professional and friendly. I am happy I joined. My HCM experience began in 2002 and I am as completely satisfied today as I was my first visit. It's like seeing friends every time I visit. Randy, Nolan, Christy, Joey---well, all of them do a tremendous job. And, I have to add, that Sarah McBride is amazing. I'd highly recommend HCM to anyone considering becoming a client. And when you go by, tell them all I said hello! I'm seventy-two, and I've been coloring my hair since I was thirty, and the girl I see at hair Club is the best I've ever seen. She is just excellent. Everyone in the office is just really nice to me. It's great to see. The staff are great. My doctor is really fantastic, very knowledgeable. I felt comfortable the whole time in there. My only issue is that I live in the Charlotte area, and I had to go all the way to Atlanta for my last appointment. It'd be nice to go somewhere closer. I would recommend hcm to anyone who is interested. My experience over the last 12 years has been very good. Most of my experiences have been pleasant and satisfying. I love this place. Everyone is very professional and the place is lively. They have sites that you go in so no one can see you but the stylist just in case you feel a certain kinds way. But all in all, I love this option. I have been coming here for about 3 years now. Joey is my stylist. He always makes me feel welcome and every time I do come in I have a ball with him. The receptionist and fast here is also very knowledgeable and professional. I have been a client at the Charlotte, NC location for about 9 years. The entire organization should be applauded &amp; appreciated for their professionalism &amp; excellent customer service. Randy &amp; Melissa are very courteous upon making appointments. Christy &amp; Nolan strive to make every appointment an enjoyable experience! If problems arise-they are handled quickly &amp; professionally. Tammy is my stylist, and is the best at this location! She is wonderful! Staff and service is awesome..!! I have been a client for over sixteen years. the staff is both friendly and knowledgeable. they go out of there way to make sure you have a good experience!!! LORI IS TOP SHELF!!! SHE GOES OVER AND BEYOND TO MAKE SURE HER CLENTS ARE TAKEN CARE OF. I ALWAYS MAKE SURE I GET HER WHEN I HAVE A APPOINTMENT!!!!!! Cassidy is the best ..she does great work. .and very friendly person. . The entire staff is friendly, but Lori, my stylist, is really top notch. She makes me feel comfortable and relaxed, and always has a good word. Not to mention she does a great job styling my hair. I would not feel comfortable with any other stylist. Lori really seems to care about the system and how i feel about it. She'll be my friend for life. I love Rita here. She is very friendly, she knows what she is doing and always have a positive attitude. I'm also very please and happy with the results I'm getting. My hair is looking good and growing thicker and faster. Overall, very satisfied! I've been a client for a year. I definitely recommend HR for all your hair needs. They did a great job on my hair making it look natural and not fake. The staff is very helpfully, friendly and they make sure you are taken care of. Thanks for everything. Very friendly staff! I love coming here on a weekly basis, it's almost like a second family to me. I will miss them when I become monthly as I am getting used to the system more and more on my own during my first year. Everyone is awesome, Chasy is so caring and detailed, Joe is just the coolest in service and Sara is just an outstanding stylist. I can go on and on about the rest of the family.... :-). Thank you for making sure I am taken care of as the staff no matter who seems to want to go out of their way to assist me. Lori is an outstanding stylist and Randy can always be depended on to keep our appointments on track. Thanks gang for making this experience both pleasant and life changing! I have been a client even before it was hairclub. Since hairclubhas took over i have been took care of in a discete and professional manner. Service has been great. Technicians have cattered to me personally as to what i want and have simply took care of me. Very happy with the service i get here. I've been a client for nearly 15 years and have ALWAYS been treated with respect and courtesy! I recommend the place and they make you look "natural" and "great"! I have been a member of HCM for 15 years, and my experience at the Charlotte center has always been very positive, thanks to Christy, the manager at this center. I have always been treated professionally, even though my experience has been more difficult than other clients. This is due to me having curly hair, and needing perms, that will change the integrity of the system after time. Also, I must say that out of all the stylists that I have seen over the years, my current stylist Chassidy has been the BEST I have ever had. They have all been great, but Chassidy has made it a specail experience by always making sure that I am satisfied before I walk out the door. Lori always does a great job! Randy is super up front, very customer friendly. I appreciate the service that I receive. Great staff and facility. I have a difficult schedule and they work hard to get me worked in. By far the best decision and place I went to. I have been going to HC(hair club) for a while now &amp; since going to HC I realized how much I missed having my hair back n my confidence. I have many close friends who have no idea that I use HC. The staff and stylists are excellent. (Melissa, Mindy, Chassidy, Sabrina, Randy, Joey, and Ms. Sully..) I hope I didn't forget anybody.. But They’re always considerate and very professional. They go above and beyond in helping me with my rather limited schedule. I know I’m a pain but they always make me feel like it’s no big deal. They really are great and I love going there!!! Always have had service with a smile from the very first day. The treatments are especially great because the staff is knowledgable and hospitable. Thank you for everything I would recommend it to anyone. I have been a client since 2000 and have found the stylists and staff in the Charlotte office to be consistently exceptional. They go out of their way to understand my needs and expectations and work to ensure my system has the look and feel I expect. I do a considerable amount of public speaking and having the confidence of knowing I look my best is critical for my success. The folks in the Charlotte office help me achieve my best. 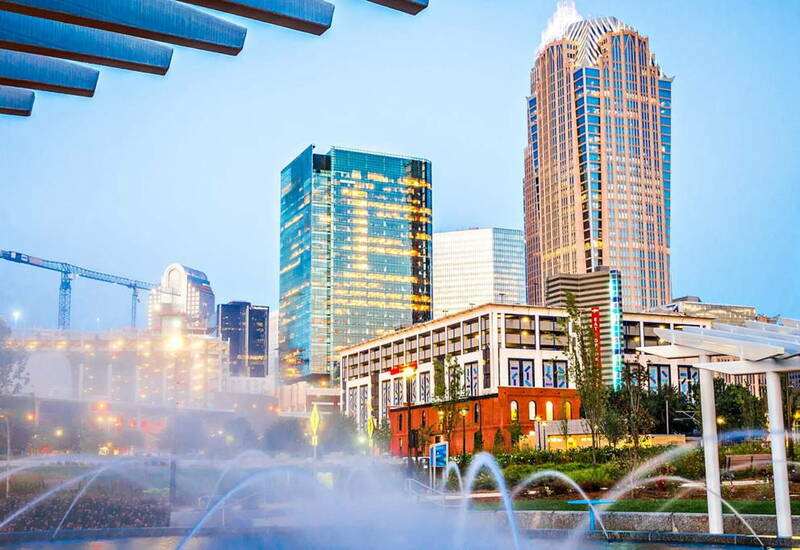 I have been a client at the Charlotte NC HCM for about 12 years. I have always found the staff to be pleasant, helpful, and very professional. The Manager, Christy, is really outstanding, and the young Lady who is my stylist, Sarah McBride, is outstanding as well. I highly recommend the services that HCM provides. Mike P.
The service here has always been great, and the staff is very friendly. I totally recommend it. I have been coming to this place for about 2 years and I totally enjoy it. you can choose from different types of hair and different styles of hair. I started with the straight and now can't wait to try some of the curly/wavy. The place is really nice and you have a privacy because they have suites. They offer you snacks and drinks too. Very professional. II like the time that Jamie puts in when deciding what is best for my hair stylewise as well as the health of my hair. Jamie in my opinion is an awesome stylist she's dedicated and cares about her clients. I am well pleased with the way she does my hair...I pray she never leave this location. I would recommend her to anyone. The staff at the Charlotte location are great, from Randy the receptionist to Christy the location manager. They do their best to make you feel right at home and efficiently take care of any problems that may arise. They have wonderful stylists to choose from. Mine is a character, and I love the conversations that we have during my appointments. Joey can do wonders with my hair and makes the time spent there fun. I highly recommend this location. THIS COMPANY IS AMAZING. YOU START WITH A CONSULTATION AND THEN YOU ARE FITTED. THE STAFF AND CREW ARE SO PERSONABLE AND FULL OF POSITIVE ENERGY. I LOVE CCOMING HERE. THEY WORK WITH YOU TO FIND WHAT WORKS BEST AND THERE IS NO JUDGING.I WAS BEGINING TO LOSE MY HAIR AND I WAS DEVASTATED. I EVEN CRIED WHEN I CALLED THE INITIAL TIME TO SEE WHAT IT WAS ALL ABOUT. BUT I HAVE NOW BEEN SEEING THEM FOR ABOUT ALMOST A YEAR AND NO ONE ELSE COMPARES TO THEM AT ALL. EVERYTHING LOOKS SO NATURAL AND I GET MANY COMPLIMENTS AND QUITE A FEW JEALOUS STARES. BUT ALL I KNOW IS THAT NOW I FEEL BEAUTIFUL, LIKE MY OLD SELF AGAIN. I have been a member of the hair club for five months and it has been an awesome experience. Jamie styles my hair and does a super job! The manager of the hair club Christy makes sure that the staff has great customer service and the members are satisfied before they leave. I would recommend this hair club to anyone who has had problems with hair loss. Each time I go to get my hair styled I look forward to feeling and looking GREAT! I look forward to being a life time member of this hair club. I've been a client of HC for 10 years and it has made a major difference in my appearance, self-esteem, and quality of life. The staff at the Charlotte location is outstanding. Their combination of professionalism and friendliness makes each visit a most enjoyable one. They are indeed a credit to the organization. Once we got tired of the comb over of my baldness we contacted the Hair Club in Charlotte, NC. They were the most helpful people and guided me through the process with nothing but the most professional ease. I look forward to my visits on a regular basis. Recommend them highly. I went into the Charlotte location 3 years ago. My Service from day one has been outstanding! The staff Is always pleasant. I recommend the Charlotte location to anyone interested. When I first started losing my hair, I was self conscious. I felt frustrated and I looked a lot older than I was - even my friends commented on my hair loss. Now, my friends tell me I'm stuck in a time warp because I never seem to age - I always look young. - Charles B.
I've always had good service &amp; stylists here.